Beauty In The Mirror: Orly Minis & Swatches. Orly polishes are like sweeties you want them all and you can never have enough! 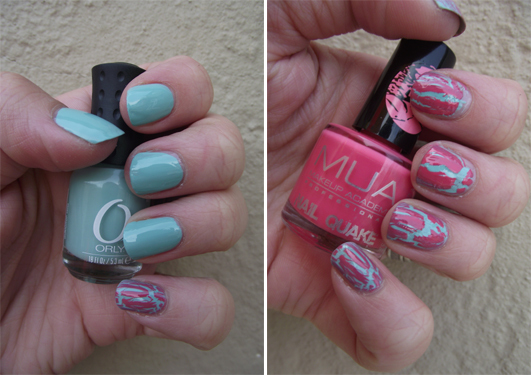 I wanted to show you 2 lovely summer polishes which I've been wearing. Also I've now used up my Nailtiques Formula 2 but have been using a treatment by Orly and can say I've noticed a difference already! My nails are getting stronger and longer which is fantastic. I know it's probably a mix of Nailtiques & the Nail Defense but I'm really loving my polishes again. The Orly Minis are so cute and great if you want to try a few polishes rather than pay out for 1 full sized polish. As you know I'm a huge fan of pastel shades and cream finishes so these little beauties have been well loved! I must say Gumdrop is my favourite, a stunning pastel minty blue shade which looks fab with a tan! I did take photos of Lemonade but can't seem to find them so I will swatch this again for you and post a quick NOTD next week. I use the Orly Nail Defense as a base coat and top coat which is ideal, I like a product which has multi uses! I checked online and found Orly nail Defense for £6.65 which is amazingly cheap!! Check out Beauty Express I have already made a mental shopping list. Have you tried any of these polishes? What are your favourite ORLY shades? I would love to know so please leave a comment below. Thanks for reading sweetie pies.